Today I ventured downtown once again, to meet a friend for lunch and try a place I haven’t been in years. 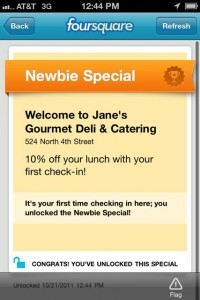 Jane’s Gourmet Deli is located on 4th Street, north of Ferry a bit in some kind of plaza. There’s not a lot of parking, but I was able to find a spot. When you walk in, on one side is a wall of wine. That’s my kind of place! It was a really neat display. Then there’s a take out counter, and some display cases of cheeses and desserts. It all looked delicious! There wasn’t a sign or a greeter, so we just seated ourselves. It was fairly busy, although there was a second room unused at the time. We sat down and a server, a very funny server I might add, came over to take our drink orders and give us menus. It was at this point that I checked in on Foursquare, and what did I see? And oh my goodness, that really excited me! In all the places I’ve checked in and all the places I’ve eaten, this has NEVER happened! I was pretty excited to show it to my waiter to get my 10% off. So if you want your 10%, go check in there for lunch one day. The menu contains a lot of deli items, of course. Mostly sandwiches, hot sandwiches, wraps, salads, and soups. 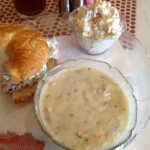 It was a hard decision, but after the waiter’s assurance that the fruited chicken salad is without a doubt the best on the menu, I ordered half a sandwich, a cup of the clam chowder, and a side of potato salad. My friend ordered a panini with tomato soup and potato salad as well. When the food came, it was so pretty I took a picture. The soup was a generous portion and looked and tasted really good. There’s nothing worse than ordering clam chowder to find it exactly as you can get it out of a can of Campbell’s, but this was tasty. I enjoyed the big chunks of red potatoes and veggies throughout. The fruited chicken salad was good. It didn’t blow my mind or anything, but it was good enough. I am an overly harsh critic of potato salad and I’ll just say that right off the bat. (Nobody’s is as good as my mom’s, and that’s the current standard.) The first bite of this was really good, and I thought I was going to wind up really enjoying the potato salad. And it was good, but the more I ate, the thicker the mayonnaise seemed to me, and it got kind of gloopy. So it was okay, and certainly better than the potato salad you can find most places, but again didn’t blow my mind. My friend reported that her sandwich, the Panini Rustica, which has fresh mozzarella, tomato, pesto and field greens was really tasty and enjoyed the bread that it was served on, which is a little different than regular panini bread. The service was really friendly too and our drinks never went without being refilled. Overall, I think as deli’s go, this is a great little place. I’ll go again. Kid Friendly: Yes, there is a small kids menu. Price: $10 for a half sandwich, soup, side, and drink. See full menu on their website.